Down Around the Corner by Dan Frueh. Down Around the Corner‘s goal is to change our perceptions of the world in which we live and work, and to allow our downtown community to appreciate the beautiful moments that happen around us every day. The work being prominently displayed on the streets of downtown will have our attentions raised to the beauty that exists all around, that otherwise may have been previously ignored. Dan Frueh hopes that viewers will re-engage their city on a visual level that leads to a greater appreciation for the beauty that exists within it. This piece is hung along the Missouri Bank Parking Garage located on 11th Street just off of Main. Dan Frueh lives and works as a commercial and fine art photographer in his studio in the Columbus Park neighborhood of Kansas City, Missouri. 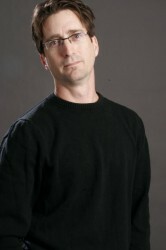 He was graduated from the Kansas City Art Institute with a BFA in Photo/Video in 1994. He own/operates the Trap Gallery, which showcases local and national artists.